Japanese Baseball Began On My Family's Farm In Maine : Parallels After the Civil War, Horace Wilson left his farm for Japan, where he introduced baseball. He's a legend there, something his relatives, including NPR's Theo Balcomb, didn't know for generations. 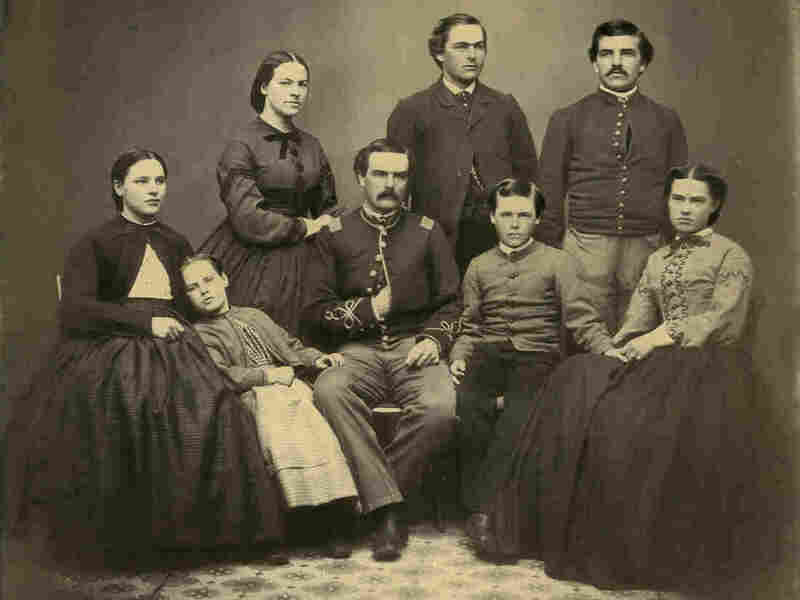 Horace Wilson and other members of his family in a portrait believed to date to the 1860s. He's the mustachioed fellow standing at top right. There's this strange story about my family that doesn't often come up in casual conversation. We don't talk about it much. I had to prod them when I donned my headphones and stuck a microphone in their faces to do this story. But as soon as we share, people shout, "Why didn't you tell me about that before?" Here it is: My great-great-great-uncle introduced baseball to Japan. No one in my family knew for generations, and in 2000 a fleet of Japanese people came to our farm in rural Maine and surprised us with an invitation to visit their country to promote the legacy of Horace Wilson — a man my family had more or less forgotten. We had to enlist our oldest relative just to identify him in the portrait from around 1860 that hangs in our house (and is at the top of this story). We weren't sure which brother he was. Mustache, no mustache? Furrowed brow or contemplative gaze? Here's what the Japanese told us about our uncle: After he left the farm and fought in the Civil War, Horace traveled to Japan in 1871 for reasons we've never uncovered. He then taught at what would become Tokyo University. As the story goes, he taught his students a game at recess involving bases and a bat and, with that, brought baseball to the country. While Horace wrote home to Maine every now and then, he never once mentioned baseball, or even Japan. 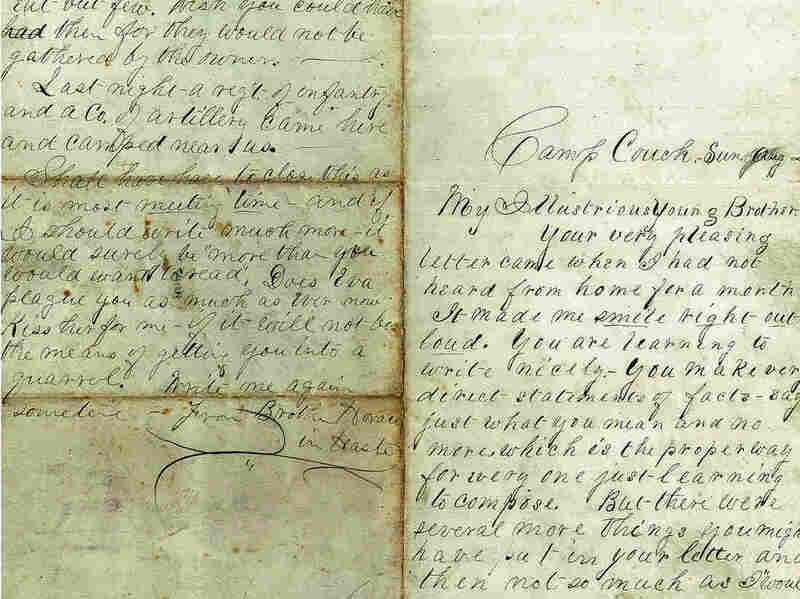 "Your very pleasing letter came when I had not heard from home for a month. It made me smile right out loud." In a letter to his brother in Maine, Horace Wilson offered some compliments and advice on the art of correspondence. His letters never made any mention of baseball. Letters like these are all that we knew of Horace, who returned to the U.S. in 1877 and lived in the San Francisco area until his death in 1927. When we heard that a man named Kazuo Sayama, a baseball historian, was writing a book about Horace's pivotal role, we were shocked. Tip: If you're looking to buy Sayama's book, Amazon translates the Japanese title thusly: Man Wilson Told The baseball In Japan For The First Time. Around the time we learned that Horace had "told the baseball," Japanese players were just beginning to join the ranks of the U.S. major leagues. Since then, many have joined and excelled. Their highlight reels are played over and over on Japanese TV. We thought we'd respond to the Japanese interest, and, what the heck, maybe we'd get some Red Sox tickets out of it. What we didn't know was that soon an envoy of Horace Wilson enthusiasts would come to our home, to present us with a proclamation. It was sweltering late afternoon on the farm in 2000. My grandmother was sitting on the porch in her rocking chair, trying to entertain the Japanese visitors. A couple of journalists, a representative from the Baseball Federation of Japan and, important, an interpreter had traveled all the way to make a pilgrimage of sorts, to what they revere as the birthplace of Horace. As Grammy remembers, it didn't go so well: "I looked over at them and they were sleeping. And I said, 'Oh, I guess I won't offer them a bed. I'll just stop there.' I was entertaining them and they went to sleep." Jet lag hit them hard. The more alert visitors in the group were gawking at my father, who was milking cows in the barn. Others wandered the fields, all the while refusing to remove their coats and ties. At supper, we had spaghetti and meatballs, along with corn on the cob. Grammy remembers that a few of the Japanese had never had corn that way before. We're happy to have the guests, we thought we'd shown them a good time (despite the napping on the porch), and just when we thought we had done our duty, one of the men rose. He delivered an invitation: Would members of the Wilson family be willing to represent the legacy of Horace and visit Japan? 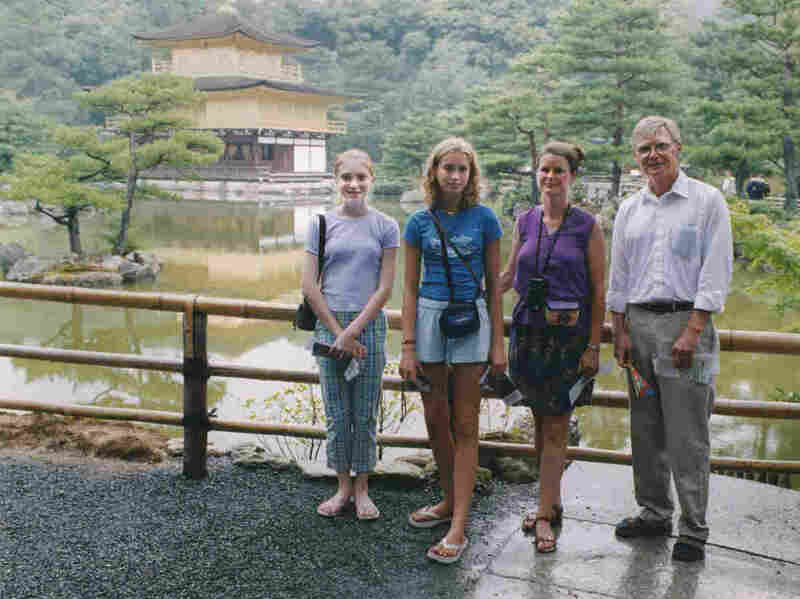 Theo Balcomb (left), her cousin Rose Sanborn, her aunt Kate Sanborn and her dad, Scott Balcomb, during their visit to Japan in 2001. So off we went. I was 13 and went with my father, my aunt and my cousin. None of us knew what to expect, but very quickly, we realized we'd be getting the royal treatment. "We arrived at the airport late and had to take a train/subway to our hotel. Everyone is very distressed." Our hosts were desperate to keep us happy, seemingly oblivious to the fact that we were thrilled just to be there. We never expected we'd have a photographer following us, days filled with nine-course lunches, meetings with baseball officials and the ultimate moment: the high school baseball championship. 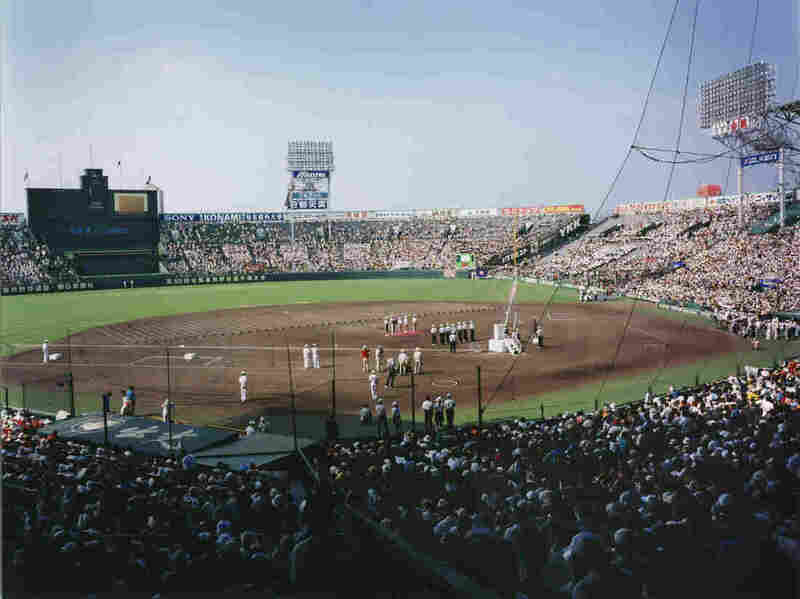 Theo and her family in Koshien Stadium during the opening ceremonies for the high-school baseball championship in Japan in 2001. A gathering of players from all over the country, the tournament is more a pilgrimage than a sporting event — and we played a pivotal role. First, there's the parade of teams, where we were the dignitaries, waving to every team that marched across the field. Next up: the first pitch. At such a momentous event, you can't just throw out the first pitch. Certainly not. What you need is a few helicopters, some red smoke and a parachute. My cousin Rose and I sprinted to the center of the field as the helicopters flew overhead, spewing a festive jet stream. The ball descended from a parachute. We picked it up and crossed home plate to pass it to the man who would throw out the first pitch: a Japanese-American astronaut, of course. As my father recalled, this man had "gone into space and thrown a baseball around, so the Japanese thought it had come full circle from Horace Wilson to space." Thousands of Japanese baseball fans cheered us. Afterward, we were featured in the newspaper, people stopped us on the street to get our autographs, gawked at us, asked to have photos taken. "We met some ball players who wanted their pictures with us. They were really happy, considering they lost their game." 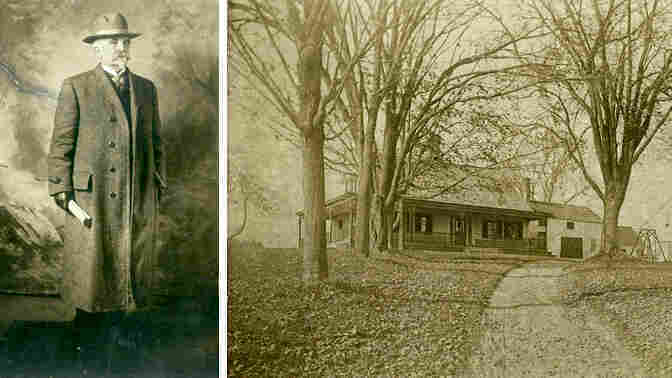 Horace Wilson and Wilson Farm, his childhood home in Maine. The theoretical end of this story is that, yes, we succeeded. We must have made a good impression on the people we met. We nailed that run to home plate with the parachuted ball. We sat quietly and smiled appropriately in all of the photos. Horace Wilson was inducted into the Japanese Baseball Hall of Fame. The chairman shipped us a terribly heavy bronze plaque to add to what we cheekily call our "Horace Shrine" at home. No, we haven't started selling tickets for a viewing. You can't find a Horace Wilson souvenir or make a pilgrimage to Wilson Farm for the true Japanese baseball creation experience. Sorry, no Horace Wilson bobbleheads for sale. There's a reason for that. When I interviewed members of my family for this story, it was a bit like pulling teeth. You can hear the hesitation in their voices. This isn't what we're used to because we're not supposed to tell boastful tales or make ourselves part of creation myths. We're Mainers. We're farmers. We're not people who change the landscape of sports on the other side of the world. When I ask my sister why she thinks people are interested in this story, she says it's not because of our family, but "because it's a really interesting story to deal with international relations." Grammy ended the interview by praising the Japanese visitors and telling me how kind they were. "That's it," she says. "Don't waste your batteries anymore." Theo Balcomb is a producer at NPR.